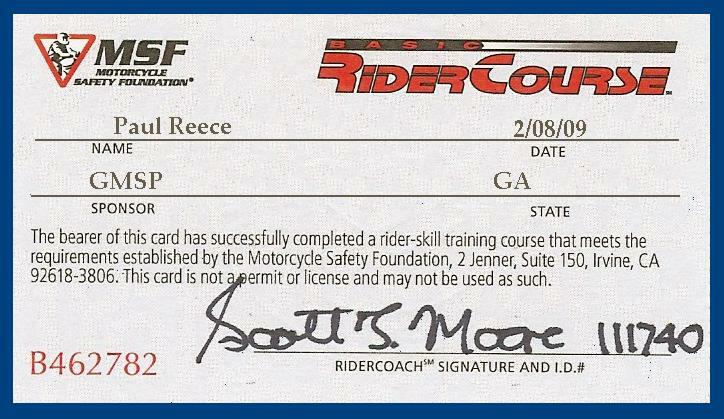 Of course each step toward the role of capable and competent motorcyclist feels like an achievement, and justifiably so. I’ll never forget my first ride on the open road, sharing traffic lanes at highway speeds with drivers who had no inkling of my neophyte status. I still get a thrill when I remember pressing the starter button and feeling my first cruiser roar to life under me. And on a frigid day in February when my big road bike was delivered, I wrapped myself in woolens and took it for a run much too short to qualify as a test ride… so those tears in my eyes couldn’t be blamed on the sting of the cold winter air. But some accomplishments are more genuinely and significantly memorable than others. After three months of trying to teach ourselves to ride, my wife, Delcia, and I were completely convinced that we were much like the defendant who chooses to be his own lawyer. As aspiring motorcyclists we each had a fool for a teacher, and as instructors we each had a fool for a student. So we did what woefully few riders do: we enrolled in a weekend-long training program designed by the Motorcycle Safety Foundation and administered in our state by the Georgia Motorcycle Safety Program. The experience was nearly blinding in the intensity of its revelations. Most of what we had taught ourselves was merely functional for our purpose of riding. And nearly all of it was plainly and simply wrong. For two and a half days we struggled to rid ourselves of newly acquired bad habits and to ingrain in our consciousness the techniques, the technology, and the attitudes that just might keep us alive in situations that end tragically for too many. I won’t subject you to the sermonizing of the newly converted; you can do your own research on the appalling statistics of motorcycle accidents. Whether you do or not, remember this: of all those motorcyclists you see sharing the road with you, fewer than ten percent have actually enrolled in formal training programs to master the skills they need to stay alive. And a ridiculously high percentage of them are not even licensed beyond a learner’s permit, if that.